As a young boy growing up in rural Upstate New York, I turned to the seemingly endless expanse of forest behind my home to occupy my time. Walking through thick old growth hemlock forests with the strong scent of pine permeating the air, I began to form a strong sense of appreciation and amazement for all things natural. Wanting to share the beauty, awe, and emotion that I felt while surrounded by nature, I turned to photography in the summer of 2004. Photography allows me to create works of art that simultaneously display the beautiful reality of nature while also allowing me to showcase my own vision and personal style. Now living on the outskirts of our nation’s capital, I continue to escape the emotional drain of the city by spending time within local natural areas as well as traveling across the country. Chris Kayler photographing deep within a slot canyon in Utah. In my hands, a camera is a tool with which to create art, not "take" it. Photography is the perfect medium for me because I can simultaneously display the beautiful reality of nature while also showcasing my own vision and personal style. This style and vision blossoms from my personal experiences with nature. Each photograph I create has a lifetime of memories and emotions behind it. Some photographs may call back to times of overwhelming loneliness, or of sadness, or of immense joy. While photographing, I let my emotions and reactions to my surroundings purposefully guide me towards the creation of something meaningful and memorable. I often enjoy looking back at my art and feeling all of the emotions that I experienced at the time flood back into consciousness. To integrate my personal style and unique vision into my artwork, I use several techniques. I make careful selections about which of my various lenses, filters, and other equipment to use, as well as what shutter speed and aperture is best to show the scene as I visualize it. These conscious selections and settings greatly affect the final appearance of the image. I utilize my knowledge and intuition of composition to include and exclude elements within the scene while ensuring visual flow and layers of subtle complexity. I use the digital darkroom to process the image after capture to more closely resemble what I saw and felt during the experience of being there. Much of the power and excitement of photography lies within its ability to depict the stunning reality of our world, and as such, most of my photographs are processed in a natural and subtle style. The most common adjustments I make are in the realms of color and contrast, and rarely by cloning out unwanted elements within the photograph. I also selectively dodge and burn areas of the image to darken highlights or brighten shadows. One of my goals as an artist is to instill a sense of awe and appreciation for nature within those who view my work. Within our culture today, we live our lives too far removed from real natural experiences and have lost our appreciation and connection with the natural world. Nature itself has become an alien concept. I take pride in knowing that my work helps to begin changing that. If my art has inspired even a small bit of natural appreciation where it may not have existed before, then I feel that I have succeeded. Chris Kayler photographing atop 14,000 ft. tall Mt. Evans during a chilly summer's evening, Colorado. 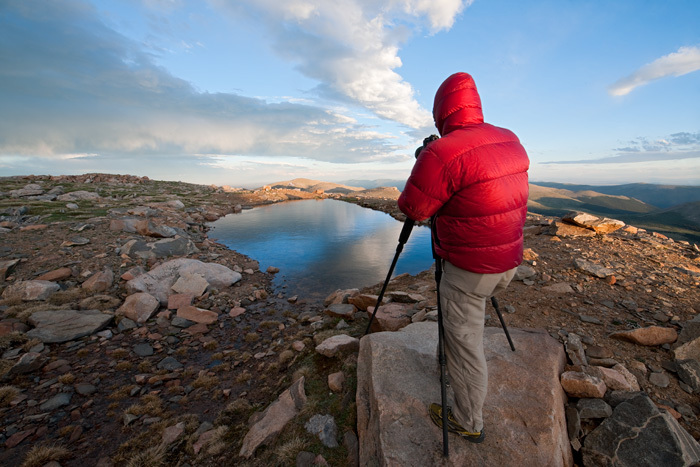 Chris Kayler photographing in the Rocky Mountains near Aspen, Colorado. Sign up for my riveting newsletter. Go on, live a little!